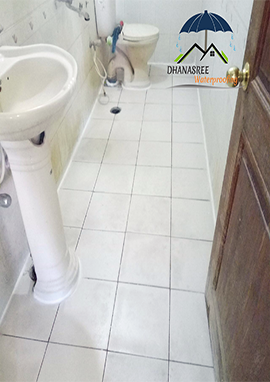 Dhanasree Waterproofing proudly offers professional bathroom waterproofing services, including toilet and shower waterproofing, to Hyderabad homes. All of our works comply with the warranty upon completion of our works. we offer top bathroom waterproofing in Hyderabad. we give quality Bathroom waterproofing services in Hyderabad.we provide the Best Bathroom waterproofing solution for clients.we are top Bathroom waterproofing contractors In Hyderabad. we give waterproofing services with High quality and low cost. Bathrooms area unit the foremost drawback round-faced by everybody attributable to the surplus water leakages. The wet areas particularly loops ought to be taken additional look after reducing water leakages. Theses leakages area unit fashioned either from pipes or the ground owing to excess water gift at the place wherever it shouldn’t be. These wet space leakages area unit the required explanation for wall damages for each internal and external walls, and that we area unit the most effective resolution for toilet waterproofing in Hyderabad. We check that chemical suits higher to the lavatory or different wet areas. If the injury is additional, we'll take the permission from our client either to interrupt the broken space or not. Looking on their call we'll select more steps.